The Spray Impact test measures a material’s resistance to water penetration under contact with sprayed water. It is performed on materials such as gowns and drapes. This test is necessary for 510(k) submissions to the FDA and to classify gowns and drapes for marketing with a level 1 – 4 per AAMI PB70 document. The test is performed in compliance with AATCC Test Method 42, the INDA IST Method 80.3, and AAMI PB70. In addition to this test, Nelson Labs can perform all AAMI PB70 testing. The Spray Impact test measures water penetration using a 2-inch diameter spray head with 25 holes drilled with a #61 (0.0390 inches) bit. The center of the test specimen is positioned at a 45° angle, 0.6m below the spray head. A 500 mL aliquot of deionized water is allowed to pass through the spray head and directly onto the surface of the test specimen. A preweighed blotter paper is placed under the test specimen. 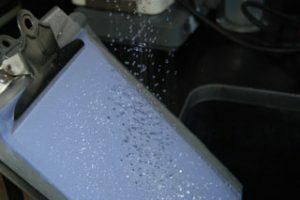 Water penetration is determined by comparing the initial blotter weight with the weight after exposure. If testing to comply with AAMI PB70, please refer to sampling details as well as classification requirements. If you have additional questions about Spray Impact testing, or would like to consult with the experts at Nelson Labs, just send us a request or call us at +1 (801) 290-7500.